I have a niece who just loves horses. I have another niece (they are sisters) who just loves penguins. So not too long ago, I found the cutest pattern on Ravelry, and I knew right away that I had to make it for Jadyn. 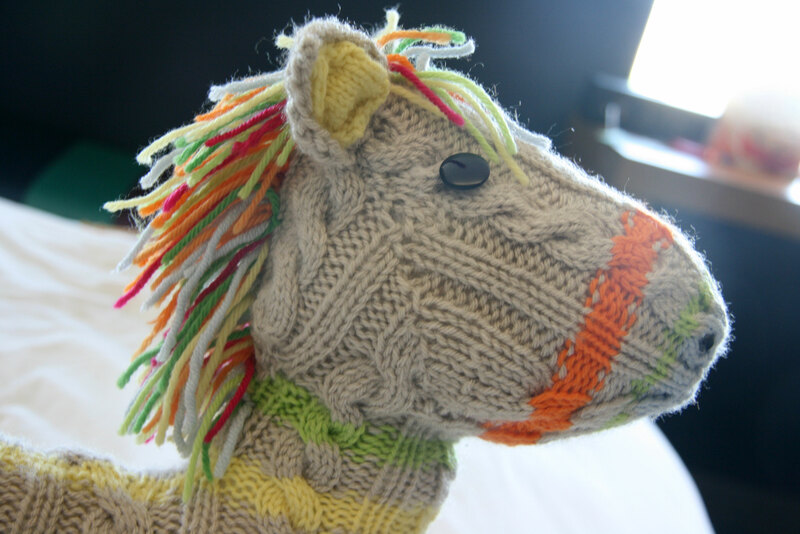 It’s called Patty the Pillow Pony. This was a really fun pattern to knit. I loved the cabling and loved the striping. The striping was done randomly. I just changed colors when I felt the urge. 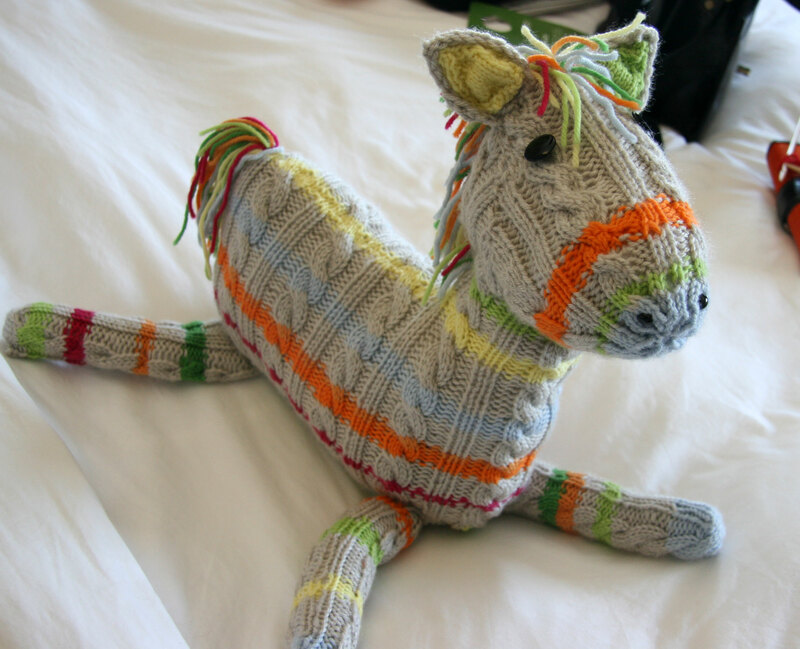 I did not get the best photos because I was knitting the last leg for this pony on the way to Oklahoma. Once I got there, I just hurriedly took some pictures in the hotel room. I used an acrylic for the gray and then I had several skeins of Cascade 220 leftover from another project that I used for the stripes. I used buttons for the eyes and some smaller safety “eyes” for the nose. He’s really very huggable, and as you might imagine, Davey wanted him for his very own. So then I wanted to make Mikayla something penguin related. 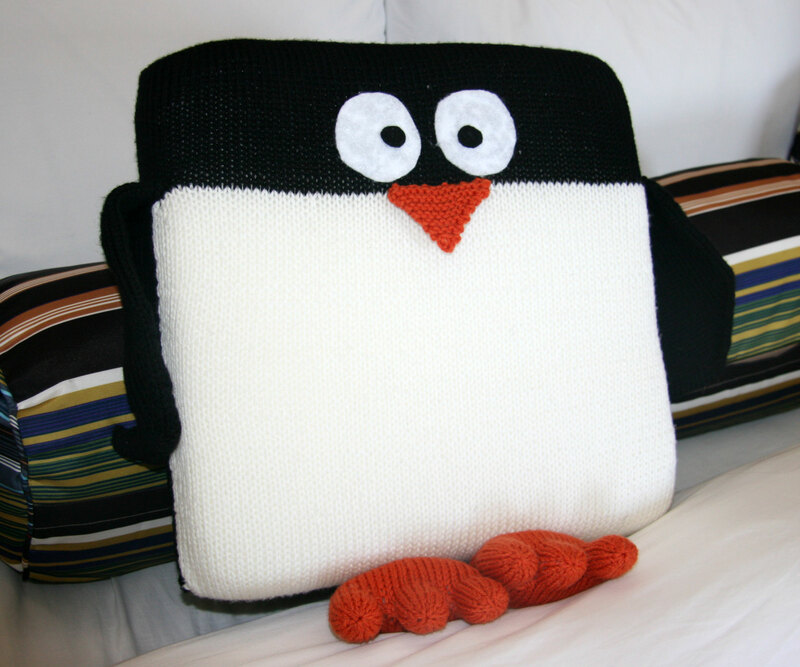 I found this Penguin Pillow Kit on Knit picks. I ordered the kit and downloaded the pattern. It was my first time to purchase a kit from Knitpicks. It worked out great. This designer also wrote great instructions. It’s a very easy knit. The trickiest part are the feet, but they are not difficult – just fun. The penguin pillow had a 12 inch by 12 inch pillow square that I inserted. The pony was stuffed. The penguin is actually supposed to have a long red scarf on. Again, I was knitting this as we crossed Kansas, and after we arrived in Oklahoma. I kept working on it even after I gave the penguin to Mikayla, so while I finished the scarf, I forgot to take a picture of it on the penguin. Both very fun patterns. I think the recipients liked them as well! Sooooo cute! Now, I guess you’ll have to make a pony for Davey. The yarn and color possibilities are endless. OMG that horse is THE CUTEST!! super cute! I want one for my son, so he can be king of the penquins!